Practice variations exist amongst parathyroid surgeons depending on their expertise and resources. 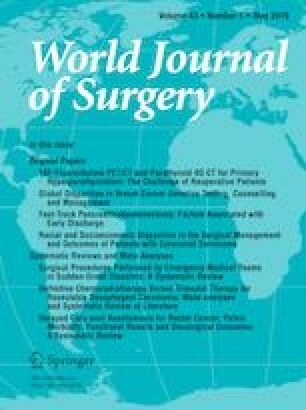 Our study aims to elucidate the choice of surgical techniques and adjuncts used in parathyroid surgery by surgeons in the Asia-Pacific region. A 25-question online survey was sent to members of five endocrine surgery associations. Questions covered training background, practice environment and preferred techniques in parathyroid surgery. Respondents were divided into three regions: Australia/New Zealand, South/South East Asia and East Asia, and responses were analysed according to region, specialty, case volume and years in practice. One hundred ninety-six surgeons returned the questionnaire. Most surgeons (98%) routinely perform preoperative imaging, with 75% preferring dual imaging with 99mTcsestamibi and ultrasound. Ten per cent of surgeons use parathyroid 4DCT as first-line imaging, more commonly in East Asia (p = 0.038). Minimally invasive parathyroidectomy is the favoured technique of choice (97%). Most surgeons reporting robotic or endoscopic approaches are from East Asia. Rapid intraoperative parathyroid hormone is accessible to just under half of the surgeons but less available in Australian/New Zealand (p < 0.001). The use of intraoperative neuromonitoring is not commonly used, even less so amongst Asian surgeons (p = 0.048) and surgeons with low case load (p = 0.013). Dual localisation techniques are the preferred choice of investigations in preparation for parathyroid surgery, with minimally invasive surgery without neuromonitoring the preferred approach. Use of adjuncts is sporadic and limited to certain centres. The online version of this article ( https://doi.org/10.1007/s00268-019-04990-4) contains supplementary material, which is available to authorized users. We would like to acknowledge our colleagues who took the time to fill out the survey.